The most important feature about our products is that we only make a very high quality sausage. We use no fillers, additives, artificial coloring, liquid smoke, or msg. Our summer sausage is a fermented product that has no water in it. All the products we make are extremely lean. Many different sizes and weights are available. One of the Benefits of working with Bavaria is that we are a small family business making only high quality products..
We do not have a minimum order. We will never make products that are sold in Big Box Stores. We also will never mass produce our products. Page Summary: European sausage that is very high quality, no filler, additives, MSG or liquid smoke. 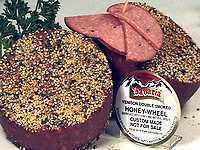 No water added summer sausage. Work with a nice small family business.